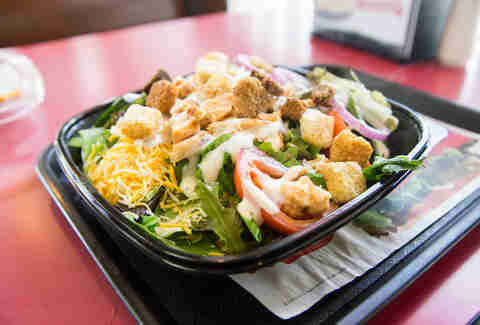 Ordering a salad at a fast-food place is like buying a knife at a gun show: they're available, but not usually the main reason for your visit. 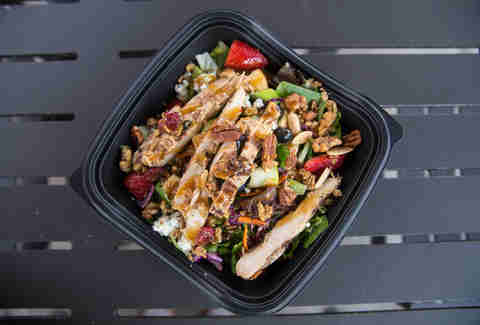 But regardless of how far from the center of the menu board these salads are hidden, sometimes you need an artery-friendly meal and your only option is a drive-thru. 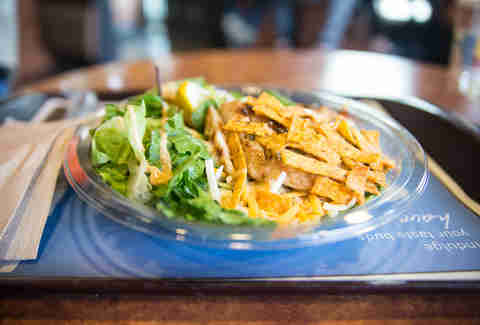 So we hit up the major chains, ordered the healthiest salad they offered (no taco salad! ), and weeded out the salads that tasted like actual weeds to come up with the eight best. Here are the ones that made the cut. Greens: This lettuce is like a romantic comedy... kind of sad and kind of funny, and also featuring Julia Roberts. Protein: The chicken is lumpy and fits the Border's reputation for nebulous meat quality, but actually tastes smokey and healthy. Extras: Black beans, rice, partially melted cheese, and an optional package of fire sauce round things out. None of them are worth putting in your mouth. 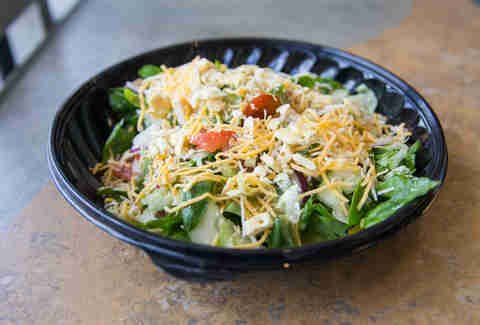 Overall: Taco Bell's offering begs an important question: what differentiates a bowl from a salad? More research is required, but I think the answer is rice. It's commendable for this chain to try to shed its gluttonous image for a moment while sticking to its marketing tone, but until a Doritos Locos salad is a thing, we'll stick with the good stuff. Greens: Despite wilt marks on the lettuce, there's still a decent crunch. It's like eating green air. Protein: Hints of McNugget, but not nearly enough hints. Extras: Paul Newman supplies the salad dressing and it tastes like Big Mac secret sauce, so there's a plus if that's your thing. The tortilla chips give much needed texture, but eating black beans at McDonald's gave me a weird sense of dread. The shredded cheese was not a good addition. Overall: If this was a character in McDonaldland, it would definitely be Grimace, which is a confounding name for a character that has anything to do with food. Greens: A mixture of spinach and iceberg. My sandwich artist had to pick some random debris out of the spinach bin, which basically ruined this part of the salad for me. Protein: Several slices of roasted deli turkey, which tasted the way Subway smells. Where does that smell come from anyway? They should bottle it. Extras: You're basically getting all the veggies you could dream of putting on your sub. I'm a sucker for Italian peppers, and their sour bite made this much more edible. They also give you three packs of crackers, which is an insane amount of crackers to put on a salad. Overall: If you like Subway but don't like bread, then this will suit you just fine. Greens: Perhaps the grassiest-tasting lettuce of the bunch, for better or (mostly) worse. Protein: The chicken is very clearly like one of Arnold Schwarzenegger's catch phrases in Batman & Robin in that it appears to have survived the Ice Age. Extras: The cucumbers are so thin that they must be pre-sliced; if Jack demanded this type of precision from his kitchen workers they'd be knee deep in severed thumbs. The cherry tomatoes are the largest I've ever seen, and I would not suggest tackling them in one bite. The “No Regret Vinaigrette” is just as advertised. 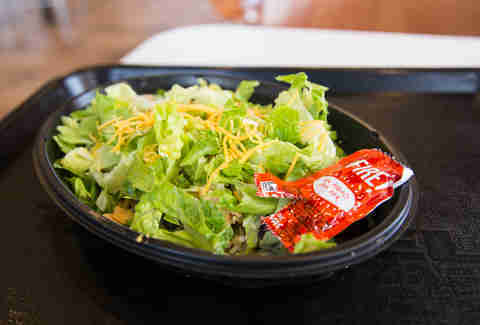 Overall: The Jack in the Box worker, who for short I'll just refer to as “Jack Jr.,” seemed surprised that I wanted a salad. Maybe Jack Jr. remembered me from my last visit when I ordered the egg rolls. He suggested the Southwest Salad, which I agreed to, but Jack Jr. didn't feel like following through on his recommendation and I received a Grilled Chicken Salad instead. I feel like Jack Jr. would get fired if his dad didn't own the place. Greens: The spring mix is like the type of mattress they don't sell many of anymore: it had lots of spring. Protein: The chicken tastes like it did indeed touch a grill at some point, but just like when I touch a grill, it recoiled immediately. Extras: Carl really goes big on the veggies. The cucumber has a fresh crunch, plus the tomatoes and onions are huge. That said, the tomato slices suffer from a severe case of sludginess. Overall: Carl doesn't have a bad showing here. This is probably what Kate Upton eats with all those gift cards she got for doing that commercial. Greens: The lettuce actually tastes like lettuce, which in the context of the rest of these salads, should be considered high praise. Protein: Wendy's spicy chicken patty is a thing of beauty, and rest assured that's exactly what you're getting here. Extras: Not much else going on with this salad except for some Marzetti croutons (a brand used by half of these chains) and some lemon garlic Caesar dressing, which is surprisingly light and flavorful for a pouched dressing. Overall: Wendy's gets a serious bonus here, because the counter dude who we'll just call "Dave Thomas" steered me toward the Spicy Chicken Caesar instead of some other salad options that sounded less battered/fried. But who am I to argue with Dave Thomas? Comparative healthiness aside, this salad is a great choice if you're looking for a Spicy Chicken Sandwich minus the carbs. Greens: No real complaints about the lettuce, but if they'd gone spring mix it would've taken this to another level. Protein: You can tell that this is a real chicken breast that they actually cooked to order; it tastes fresh and juicy and looks legitimately like chicken when you pull it apart. Extras: The apples are surprisingly perky, and the cranberries pack both sweetness and a bitter contrast. But the real kicker is the blue cheese, which if you close your eyes and forget you're in Burger King, seems upscale. Overall: The fact that you need to close your eyes to fully enjoy this salad takes off a few points, but BK hit a true home run here. I didn't have high expectations, but I would've eaten this whole thing if I didn't need to eat five more salads in the next two hours. Greens: This seems like the type of lettuce that a rabbit would love, and the munchability is off the charts. 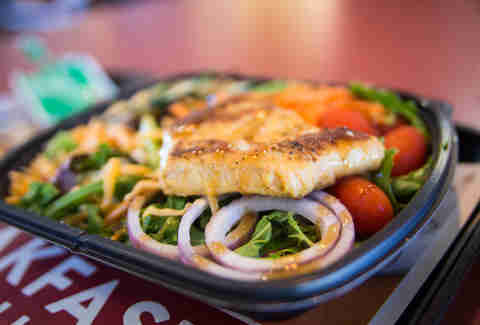 Protein: It isn't quite Chick-fil-A's breaded chicken, but the grilled option still stands out as the best protein of the fast-food salad canon. The grill marks give it a dose of extra flavor that makes me consider ordering its Grilled Chicken Sandwich on my next visit. I don't think I actually will, but that's a serious achievement in itself. Extras: Here's where this salad truly shines. The holy trinity of berries make a bold appearance (blue, straw, and cran). The apples are tart and seem recently sliced. Strings of radish and carrot add color and texture. The dressing choices are above and beyond (honey sesame was my jam, and I assure you it jams hard). Plus, they give you little packages of granola and roasted nuts to spruce things up. Overall: When tackling this salad test, I hoped there'd be a few surprises. I won't pretend it was easy to stare at a fast-food menu board and choose the wimpiest options. 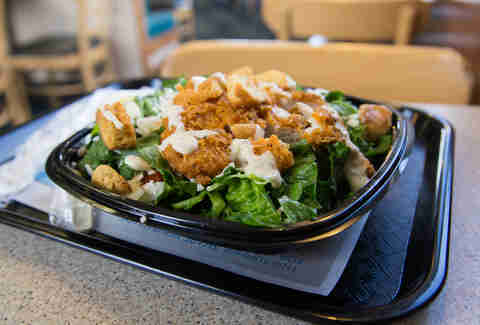 Burger King, Wendy's, and Carl's took their salads seriously, but Chick-fil-A was the only chain that seemed to truly excel at the bunless option. 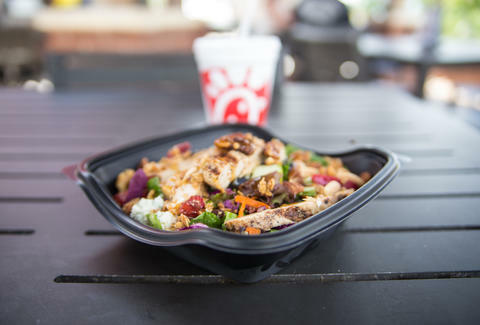 My one complaint is that Chick-fil-A undersells this thing, as it's not clear from the menu that you're basically getting a salad and a fruit cup in one. But overall, regardless of which side of historic Supreme Court cases this chain aligns itself with, love is love. And I loved this salad. Dan Gentile is a staff writer on Thrillist's national food and drink team. He knows that he omitted several major chains from these rankings, and it was out of consideration for their feelings and not because he forgot that Arby's existed. Follow him to trying not to piss people off at @Dannosphere.